Among the uncertainties concerning the contribution of permafrost thawing to C cycle, the processes associated at the vegetation and at the microbial activity in the soil are of extreme importance. An increase in Net Primary Production in response to global warming and its interactions with the C cycle is predicted, but is not clear how much of the forecasted CO2 released by soil respiration due to permafrost thawing can be balanced by the CO2 assimilation through photosynthesis. The SIOS funded project “Contribution of Vegetation and Soil components to Carbon cycle in Arctic environment in relationship to climate change (VegSoCA)" is trying to disentagle these questions. 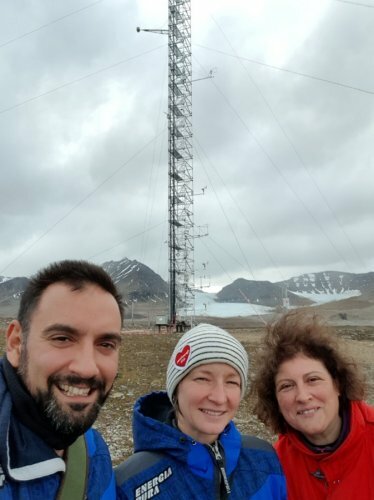 Field work was conducted in Ny-Ålesund close to the Admundsen-Nobile Climate Change Tower (CCT), since the photosynthetic characterization of higher plants in this area was already performed in previous studies. The plant species taken in consideration were some of the most representative of this High Arctic tundra ecosystem such as Salix polaris, Dryas octopetala and Carex rupestris. The experimental approach used was the pulse-chase isotope labelling. The heavy stable Carbon isotope (13C) was used as a tracer for Carbon fluxes from atmosphere, through the plants, to the soil and again to the atmosphere via respiration. Chamber used to perform the labelling of 13C on a plot of Dryas octopetala (Photo: VegSoCA). Three researchers from the National Research Council of Itlay (CNR) - Angela Augusti, Olga Gavrichkova and Emanuele Pallozzi of the Institute of Agro Environmental and Forest Biology - arrived in Ny-Ålesund the 12th of July and started to set up the labelling campaign and other biophysical and biochemical measurements. Due to mixed weather conditions, they had to wait for a couple of sunny days to be able to perform the labelling. Finally, they managed to start their measurement the 16th of July and continued with collecting above ground material and soil until the 2nd of August. These samples will be analysed for the 13C composition in different cellular compounds in the Laboratory of Isotope Ratio Mass Spectrometry of their Institute. 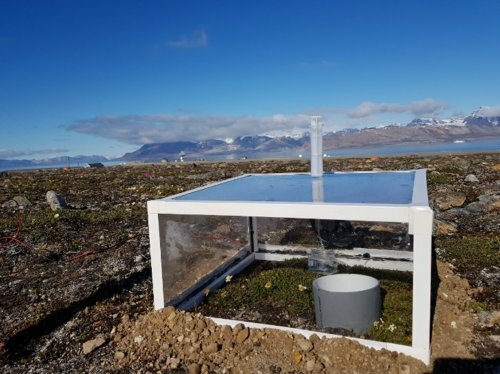 Hopefully, the results will shed light on the complex processes - mediated both by plant and microbial physiology and climate - that affect the carbon cycle in Arctic ecosystems and that are needed to improve climate prediction models. to be able to start labelling (Photo: VegSoCA).